• A professional driving team. It is not really about us, as we are proud of our achievements and continued growth. Our business has been built on quality at all levels. 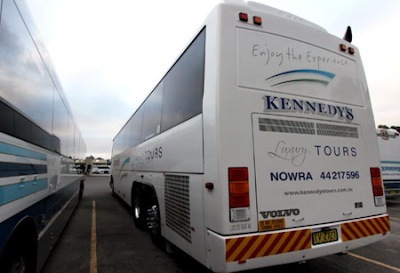 Kennedys Bus & Coach has a quality fleet which services Nowra and the greater Shoalhaven, Southern Highlands & Illawarra. We offer a comprehensive bus & coach charter service, this includes itinerary planning & booking services. Our range of quality vehicles from 7 seat to 6 seat enable us to meet all booking requirements. Customer and community feedback has been very much appreciated. The customer is always in the forefront of everything we do. We are constantly thinking of new and better ways to do things and improve services we provide. We would love you to join us on a luxury coach tour or arrange a quote to suite your needs. Our motto “Enjoy the Experience” is exactly that, it is important goal for us from the youngest passenger traveling on a school bus to senior travelers Touring Australia in our luxury coaches, enjoying their travel experience. Our history and reputation has been earned by hard work and desire to achieve high standards. We welcome you all to the Kennedys Bus & Coach and Kennedy’s Tours family and would be happy to assist you with your bus or coach needs at anytime.